Such a sad day in the history of this school. The demolition started on November 18th and is set to be complete by January 5, 2011. The school has been there since 1927. 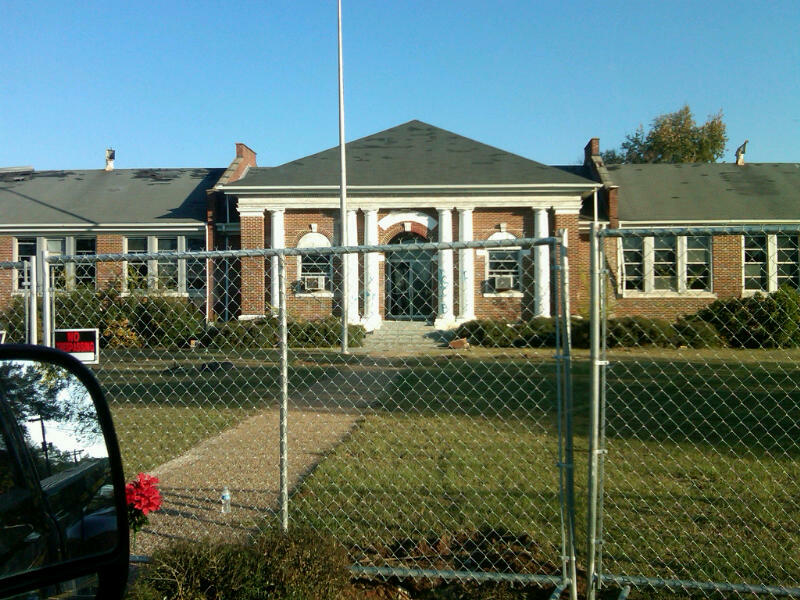 It was one of the oldest existing school facilities in the state of Alabama. There are generations and generations of families that went to school here. Many historical societies tried to save it, but were unsucessful. We managed to get into the school before too many things were torn up or destroyed. We have beadboard from the walls and even some paneling that is in good condition. We are making picture frames, framed chalkboards, and mirrors with the chipping beadboard as the frame. What a wonderful piece of history to own from this school. I’m sure there are so many memories in each piece. The framed pieces will be priced according to size. This is a sample of what a frame might look like. These will go quickly! Get your gift of the Tuscaloosa County Highschool history while you can! The paneling is 2x8ft with a wood grain facade and is selling for $95 a piece. 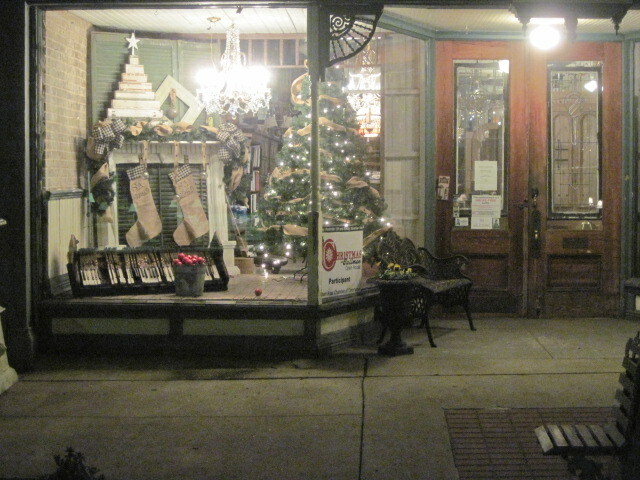 Last weekend was Christmas in Cullman. It’s the weekend to kick off Christmas! There is a parade and Santa Claus……loads of fun. The whole town gets involved and there are so many cool things to do. We were open all weekend. I know, right! Open on Sunday! It was great. There were people all over the streets of Downtown Cullman. Walking in and out, doing lots of shopping! We weren’t quite prepared for getting into the “Holiday Spirit”. Kolby was going out of town and there was some recent “BIG” news about Cullman County going Wet. Yes, they have been a dry county up until the last Election! November 2nd was a day to mark into the history books! I don’t know if you know, but Garlan, Jr., is the President of the City Council. So, needless to say, he had a lot on his plate! I decided to step in and work on what Southern Accents would be doing for the weekend’s festivities! I dug through all of my Christmas decor and pulled out all things rustic and burlap, loaded up my car, picked up my friend, Daphney, and we headed north. We had some windows to decorate! When I think of Christmas windows, I automatically think of New York City. The windows in New York are story telling! They all have such beautiful windows. I could walk up and down 5th avenue all day looking at them! One of my favorites is Bergdorf Goodman. The windows seem so real and do tell a story! I just read online where Saks Fifth Avenue would have bubbles added to their building for this holiday season. Bubbles? I mean, the snowflakes that are covering the outside of the building are breathtaking! I found this photo on Flickr. I can’t wait to see how the bubbles and snowflakes turn out. Too bad it will be from my computer and not live and in person! There are two windows to work with. They were both a lot more work than we bargained for. It is freakishly hot in those front windows! We only had 4 hours and got started immediately! The tree they had was only 4.5 ft. Seriously? Ok, we went next door to the florist and bought one of their old trees for $25! Awesome! We did have to take the old lights off…they didn’t work. A HUGE thank you to Shane! He worked on those lights for a couple of hours! The mantel with green shutters was the perfect backdrop for this window. I love how the burlap stockings turned out! We could’ve really done a lot more with that tree, but we ran out of precious time! I think the piano finishes it off nicely! The second window, needed a bit more work. There was already a mantel inside. We just added garland and burlap ribbon to it and adorned the top with a few stars and red tiles from around the store. We did put an old industrial cart in that window. It isn’t on wheels. It’s the perfect table! The 4.5 ft. Christmas tree was perfect for this side! We added bead board ornaments to it. They are stamped with cute Christmas words like, Ho Ho Ho, Joy and Peace! They are adorable! 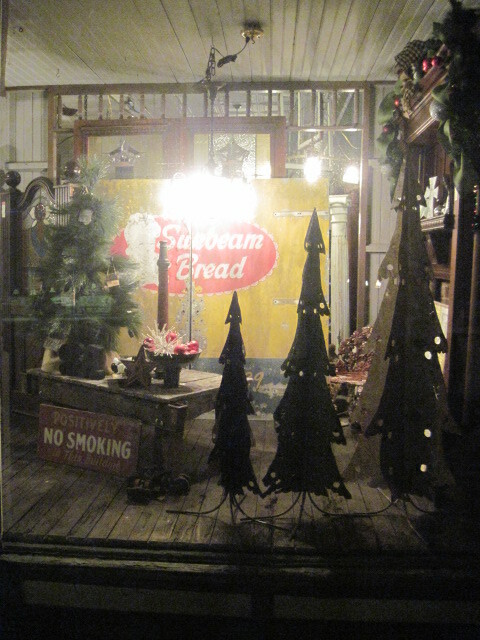 We found red pieces from around the store to add to the window like the No Smoking sign….a little festive and quirky! I was so thankful they thought to take pictures at night. They aren’t the best quality, but give it a certain aesthetic that just works, don’t you think? I love how they turned out. I could tell you all the things I didn’t get done…..but, if you never know, then you don’t know what you are missing! Southern Accents has been a green company from the beginning. We started by recycling antiques! Dr. Gudger was way ahead of his time. We have grown the collection throughout the years. I love to go into the gym looking for just the right wood for a project. The gym is a warehouse full of salvaged wood! It used to be the gym for Wallace State. They played their basketball games there. They actually rented the gym from a local monastery. After the school built their own gym, the nuns tried to rent it out again. With no luck finding renters, they found a buyer…….you guessed it, Southern Accents! If you are interested in looking at this vast collection of wood, you can make an appointment and someone will walk you through the inventory and help you find exactly what you’re looking for. We have designers coming in all the time looking for the perfect wood for their project. Gayle Christopher is a furniture designer/builder from Birmingham. You have to go to her website and see her incredible work! Her company is Rustixs. Gayle will come to the store looking for something in particular. A few years ago, she built a table for the Coastal Living Idea House. The table was featured in the November 2007 issue of Coastal Living. She used a red oak wood that has circular saw marks. These marks give the table texture. Look on Rustixs.com for more tables and furniture pieces. Gayle also built a cabinet for the Birmingham Symphony Show House from the same oak timbers as the dining table. Lesson in wood: Circular Saw marks are the marks that are created on wood when it is milled in a saw mill. Saw mills became popular in the 1890’s. Before the saw mills, the logs were chopped with an axe leaving chopping marks on the wood. Hand hewn Marks are the marks on the made into the wood when cutting down a tree for log cabins. They would take an axe and make into square logs. Ahhhhh, I love a lesson! We should all learn something new everyday! Let us know if you need anything! We will be open this Sunday from 12-6pm. Hope to see you then! Have you ever been to Southern Accents? Have you seen our website? We are also on Facebook and Twitter. There are many ways to connect with us, to find out more information about us. We love to hear your feedback….good and bad. We can always learn and grow. Recently, we were talking about what to do to combat bad press. This internet thing can be the best thing for your business and at the same time, it can ruin you. We want you to know that we want your experience to be the best it can be. We have so many wonderful items in our store. We have warehouses full of wood and yards full of tubs, sinks, gates, concrete benches and urns! Tell us what you think. Tell us what you are looking for. We have so many resources and can find almost anything! It’s a fun business we are in. We love helping people find a treasure. We are good pirates! We are ready for the season. Did you know there is 1 month, 44 days, 1,063 hours, and 63,757 minutes until CHRISTMAS? Wow, I’m not ready! How about you? It’s going to be here and I will be out at the last minute doing my shopping! If you want to be on the ball and have a ball, you need to come to Cullman, Alabama this weekend! We are getting started Saturday morning. Come and enjoy the parade that will start at 9:30am at the Busy Bee and go all through Historic Downtown Cullman. There are so many things for the whole family to enjoy. We wanted to extend an early gift to you. 20% off your entire purchase this weekend. Since tomorrow is Veteran’s Day, we will go ahead and get that started tomorrow! So, start shopping early! We are working on creating some beautiful hand-crafted items that are great Christmas gifts. Our own Santa’s wood shop is working on them, as we speak. It all started in 1969 when Dr Garlan Gudger starting rescuing architectural objects from buildings slated to be demolished in his local Community of Cullman Alabama. Not realizing his hidden desire of antique building materials would flourish into one of the largest stores in the nation, Dr. Gudger just consistently did what he enjoyed year after year – rescuing and restoring architectural salvage. Being ahead of his time, he knew the demand for his recycled material would not balance with the supply he was obtaining, so he started organizing the salvage into his 2 car garage. It didn’t take long for word to spread of this “Garage Collection” and the quality of antiques that were showcased. People slowly started to congregate early every Saturday morning to see Dr.Gudger’s treasures. 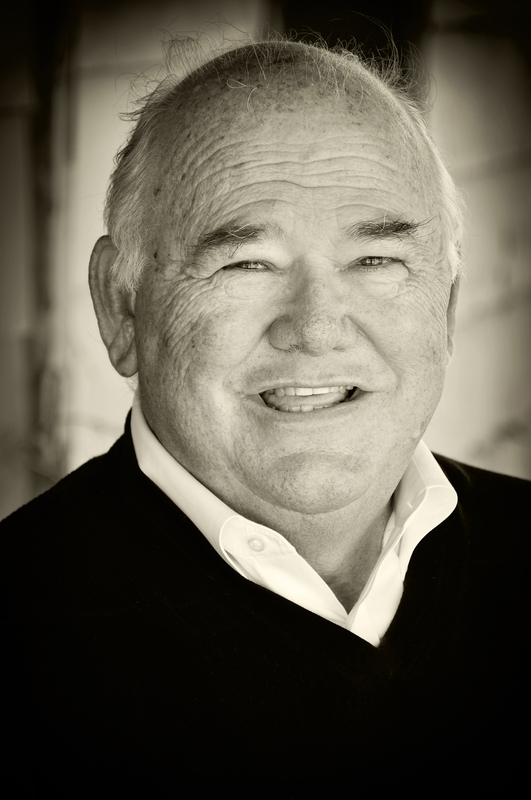 Over time, he realized the interest of this industry was gaining momentum and opened a small shop in North Cullman. As always, his desire and years of hard work paid off as he began collecting notoriety for owning the premiere architectural salvage store in Alabama. Next year, Dr.Gudger will be 70 years young and has accumulated more knowledge through his salvage experiences than most could fathom. Even though he isn’t doing the physical labor of the demolition anymore, his expertise and understanding of the industry are still utilized at the store everyday by his Son, Garlan Jr. If you are lucky, you can catch Dr.Gudger at the store for a few hours a day to ask him a question or just to let him tell you a story of his adventures in salvaging. Although, catching him at the store is nearly impossible! He doesn’t stay around long, because something new has taken precedence over his life long passion for architectural salvage! Something he refers to as his new passion, “Grand Children”, he says smiling……..
Old things turned into New works of art! I can’t tell you how much I love the wood shop at Southern Accents. Those guys are incredible! The coolest thing is everyone that works there can make things in the wood shop! If you haven’t been there before, you will find it in the way back! You have to go outside of the front building, through the back building, to the left and behind the “wall of old doors and windows” (another post all by itself! ), finally you will find this wood shop. Lots of big tools and men using them. Sounds interesting, huh? 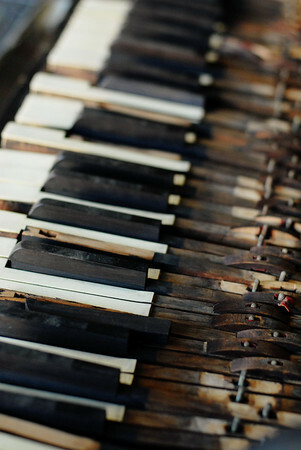 If I could be in charge of the wood shop…..I would have all kinds of beautiful things in my home. I would just get them to make more than one of each…that way we could sell them and it wouldn’t become my own personal wood shop and………….I wouldn’t get fired!! This is just a few of the most recent works of art at the store. You can click on each picture and it will take you to our website! Doesn’t this make you think of Joseph’s Coat of many colors? It’s so beautiful. It was designed and created at the wood shop! 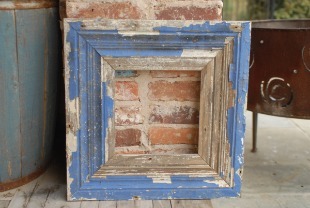 We always get in different shapes, sizes and colors of old salvaged wood. It comes from old homes that are “saved”. Old….created into something new! What would you do with this? I would hang it on the wall as a focal piece or wouldn’t it be a fun headboard? What about adding …………. It’s a table! Ah! I love how they thought of that. Options, don’t we love options? Take the same idea and make it smaller. You still can have a focal point for a room with several of these displayed on a wall together. Why not just lean one up on top of a mantel or on a shelf? They can be designed….for a special place in your home! Certainly not least of all, we have frames! I could take all of these and then have them make 100 more! I love how they are all different. I want the one that the paint is peeling the most. I want it to have enough character that I don’t have to put a picture of my adorable children in it to make it gorgeous! There are already new styles of these frames. All you have to do is call or email us…..we can have it sent out right away or just come by! !